"2D | Isometric | Choice-Matters |Role-playing game"
You’ve been meaning to go on a vacation now for years. to cater to you every second of every day. But something is off. There’s this group of scout kids staying there that look like they’ve seen a ghost. a criminal power vacuum and a terrible conspiracy. 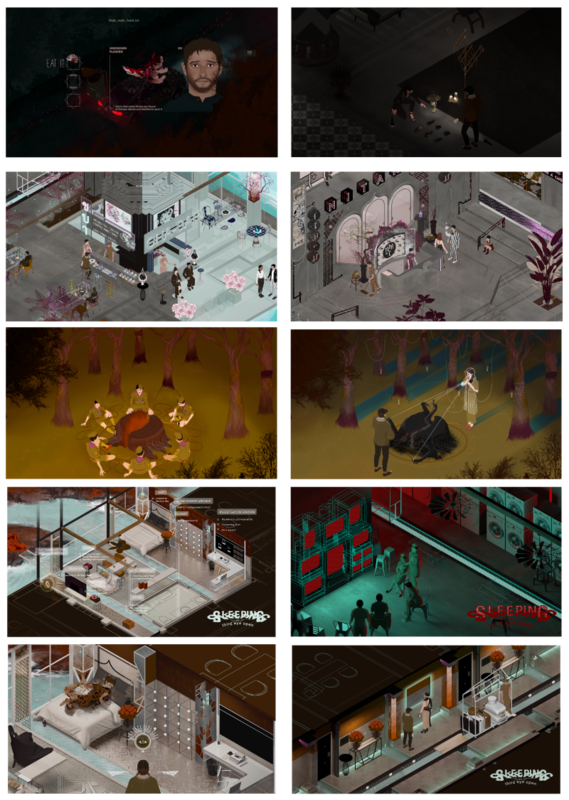 "Sleeping with third eye open" is a 2D isometric ,narrative, role-playing game. Revealing itself surreal terrifying events to its patron. A narrative that are branching into horror, science fictional or Noire themed. with thrilling twist experience of a vacation. A folk horror tale with whimsical touch. is inspired by Southern-east folklore, Thai mythology and Golden triangle. Malila - A Receptionist, front desk administrator. Resources : Access to hotel administration and guest's Information. Khan - A Hotel lobby boy, guest relation agent. Jun - A golden child of a wealthy family, A VIP guest on a Ongoing continuous vacation. Resources : Wealth resources. Access to privileged services and area. Tanya - A Biology graduated foreigner , botanist visiting on her vacation and expedition. "Hello Everyone and Happy 2018! My name is Kian here. I'm 24 architecture-major graduated freelancer. But, my passion lie in making video games ,and at the moment,for create something i ,myself, would love to play. hopefully there will be someone like me who will enjoy it and make me feel less like a freak. Devlog: | 03/01/2018 , The beginning. Hi all, Kian here. first i have apologize for my poor English writing ability, if any error so bare with me. I have studying C# with unity for this past year. I also have basic in modeling and passion in art. So, in these just recent months i have been developing and design this game by myself. but, i was struggling to find the platform to tell the story, like a play or a short-film. then it hit me!, A Game! of course. I love games! and it's a amazing way of telling the story. And, so here we are.. The reason behind my setting is because I've always been intrigued on how hotels work in general. To take yourself out of daily, comfortable environment and routine and place yourself in this luxurious vacation exotic scenario that aim to refresh or re-vision your thoughts and your way of thinking. And also, the idea of hotel rooms fascinates me,the same yet different scenario of events that happened in the same space as you and everybody in. and My decision to place the events in this exotic south-eastern Asian; As i am Thai myself, I'm finding my native believe and ritual enchanting. Definitely inspired by true local believe and their understanding to world ,as I feel it was under-presented. The design and story were inspired base on research but adopt to fit the fictional aspect.
" BEWARE for poorly wording and grammar errors and poor." You're not a freak for liking the strange and esoteric. This looks very interesting. Love the artwork and especially the color choices. Keeping a (third)eye on this one! visually spectacular. pair this with intriguing writing and clean mechanics and you could have something really special on your hands. Those GIFs are absolutely hypnotizing. The looks awesome! The longer I look at the GIFs, the more fascinating details I discover. Following this! Adore the art style and really intrigued by the premise. Will be following this for sure. Really like the look of this. Interested to see where it goes. that could determine many fates in this eventful week. Tailoring your experience of your stay. Discovering which mysterious event would you be involved and what truths would you unfold. Seeing how your actions could change everything including you. Sounds fantastic. Are you thinking of handling this with pre-set branches or through some kind of procedural system? such as your basic 5 human senses, to discovering more information to help weigh your decisions. While tracking consequences of your approach that will have effect on the story ,characters ,environment ,and you. 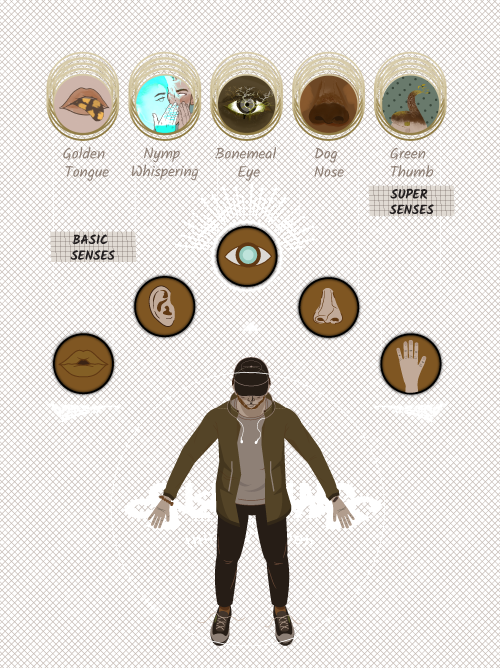 I like this, but applying the five senses, might be too human, rather than game-centric -- if that makes sense. I always find it's hard to balance making the simulation engaging for the character, versus the player. Since the player can optimally see and hear things, with a rudimentary ability to touch, perhaps that should be the focus? Just a thot. You are not a freak, this game looks absolutely amazing. I haven't seen anything like it! From the design to the narrative you've developed thus far, I'm hooked. Do you have a website or social channels for the game that I can follow to stay updated? Not to rush you, because art takes time, but I need to play this!! Hope the first week of 2018 treat you kind! if you should take yourself on certain path. While they will have each own personal and main quest. While they are essentials to story, Choosing to involve them is optional and is 'a choice'. your relationship and behaviors throughout your stays. 'Choice matter' games. 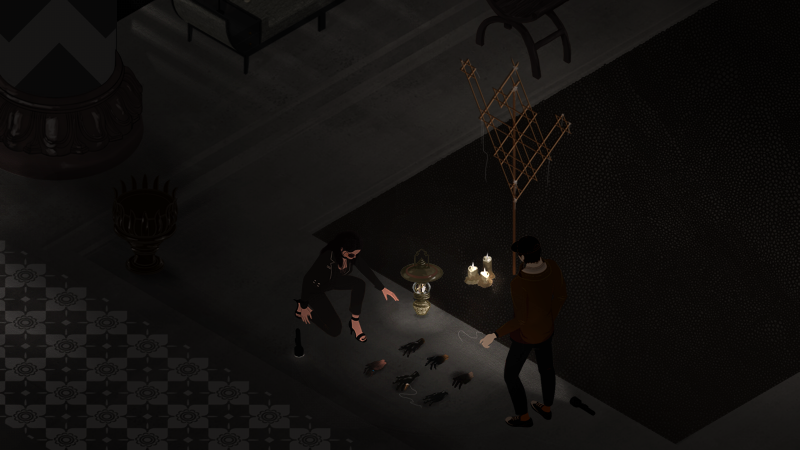 As this game is narrative-based and no combat (But, maybe just a tiny gore). These characters are the factors of your core experiences to be emotionally involve and care. to be more than just a fictional tale. but with background and stories. reasons that drive them to be as they are. dreams and fears. defensive and insecure. hope and values. In the beginning phase of designing characters , I were having a hard time come up with the character style. feel emphasize , relate and immerse toward.required imaginations by just portrait and heavy text. Well Simply, if you don't care about the character then you choice for them wouldn't matter much. I'm having hard time coming up with alternative. set direction of the portrait while having convo. It is still in process on how it will overall work out, and look. Right now, i was planning to use painting style portrait to animate which turn out to be.. refreshing maybe ? *I have to apologize for my English. if you find hard to understand on my explanation. This looks great. I want to play it. I'm going do a another post elaborate on this too, It will be more like procedural system. Because one thing i'd love about these choice games, is to feel like your actions is taking accountable for, seeing all the tiny choice come together or your many choices are do matter, not just a. or b. So, it is heaps bunch of a flag triggers. And, Having linear timeline of 'a week stay' helps, make me me focus on exactly how everything gonna collide to together in different outcome and unfold. I understand the concept is a bit weird on that line of translation of your character's senses to player. My game will mostly be on character-based which means it will be like more of a text / visual diagrams representing and sounds. It was actually my intent to reflecting on those 'point and click'/ Telltale's investigation type.But instead, put you into more control of your senses in the investigating scene. SO it will allow you to enact freely and to certain part of area's environment, so i will be coded with radius of the clues. also another reason is for the purpose of story too ,which actually you will get received enhancing or upgraded your senses thought out your stays, like a ability/perks but perception-base.Example ; you've done ritual applying bone meal to your eyes ,able you to see another realm etc..
From the idea of a base, like CRPG's keep to Mass effect's Shepherd master bedroom. inspecting, reading codex or collecting clues. So in this game your room act like one. Its the place where every quest you ended, you will land back to. some quests may give you trinket for you to store in your room or for later-use. some quests are occurred in your very own room. And, some quests are here for personal intimate relation event. Your room main function is meant to be a way to proceed to the next day or period of time. advertisement for more understanding of this fictional world. 'A Record player' for playing OST in your room for the ambient. 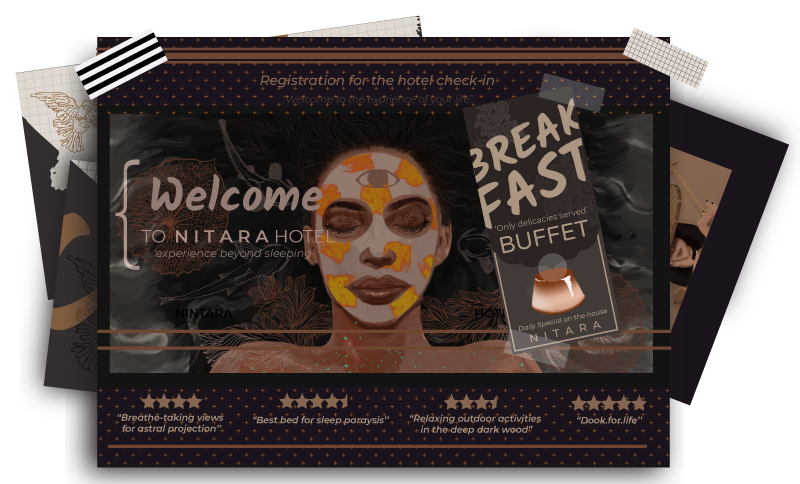 'A hotel pamphlet' for checking out daily hotel activities/events. 'A phone' for calling reception , room service or other character to come to your room. 'Investigation station' to review on your process or using mock-up search engine for researching. As game focus on perception aspect. There will be limitation for your sight. but you have your understanding as representing in a plan-line drawing. 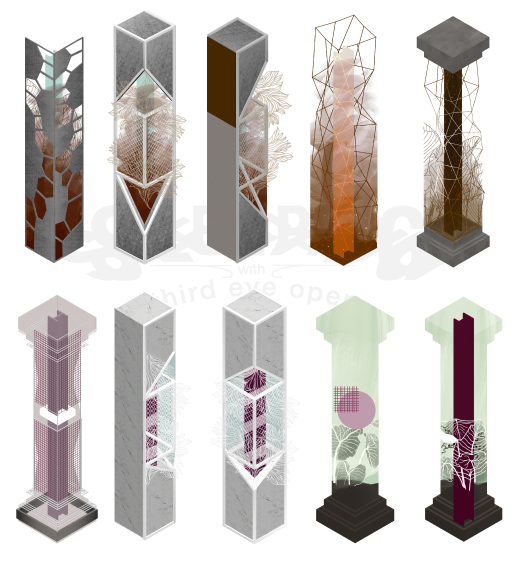 I also have fun designing all the column elements in this game as decorative aesthetic features. in-between of nature and man-made elements, making it interacting and intervening. Wow this is UNIQUE. In a very good way. Really interesting stuff so far! Using in-game senses to acknowledge your surrounding can be vital in the game. It is a core mechanism of the game beside decision-making. the information also can help weighing your decisions in gathering these tiny bits of them. for acknowledge common surrounding ; taste/talk, sight, touch, smell, and sound. by finishing certain quest line as a reward or to repeat some certain action till you've achieved as skill. the surroundings or provide special skills and senses to some situation. and useful for the equivalent for some of the Super sense that you might unable to achieve. the NPC and can providing the new route of solution in certain quest for its specific tag. "coming from a believe of ritual where you apply cemetery dirt/bone meal of the dead to your eyes will let you see them"
Hello, guys. It've been a busy week. for new game information and screenshots. Journal |reviewing of what you have done. there's reminder stickynote for showing schedule. 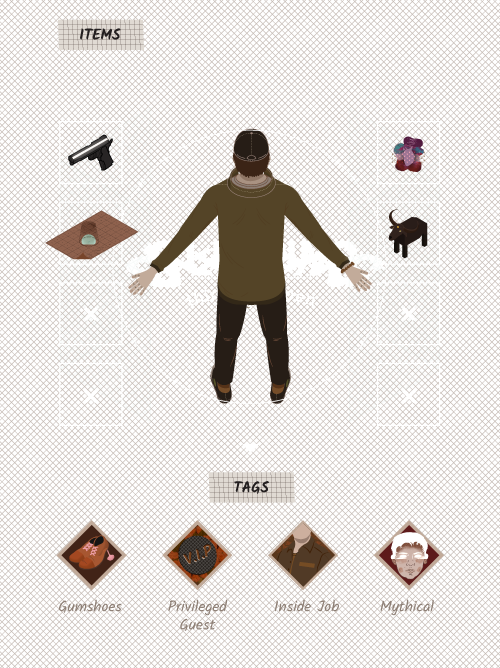 Backpack | Inventory system of items that you own. bring the codex journal page of the related content to the quest. + A 'Optional' action that you should consider done to provide more information that you about to get involve in. could play significant role , even be a big factor or provide new solutions on outcome of the quests. interface looks really clean and robust. i'm really interested to see how all of these systems will work in concert. and the art and design within January, so..
A game thrill narrative themes is to create curiosity ,suspense ,mythical and horror experience. With Choice and consequence system are great format to tell a story into collision of these themes. Instead subtly engaging you in with quests and your own length investigation by the game 'sense' mechanism. in Game. While Movie media is only active in their way of telling story, Game have its way of capable on being passive. Its add replay value and create individual experience for player and make them specially yours. A week,7 days Hotel stays is the game rigid time-frame that design to be controlled but yet freedom in its pacing. while the thrill events is the appealing key. the main theme will also be surrounding on the idea of 'hotel' / an alien new place for you!. where no one know you for a period of time ,which could be a good epitome of a role-playing game. either to re-identify or re fresh or just to lose control. which hotel is my fit setting for modern 'a role-playing' game. in great decision design on points systems that deal with narrative of conflict and dilemma for you to balancing and compromising. Additionally,The detail changes of surrounding is something i'm inspired and adore so. it's a tiny bit but yet effectively giving satisfaction at least for me in game's acknowledgment your action. As Southeast Asian black art lore are not commonly represented. I reckon there are some similarities in The black art and believe around the world. The Witcher 3: Wild Hunt's adaptation of polish folklore. The Water hag to that flying blue glowing baby 'botching'. Thank you so much. I'm designing the game on the motto of 'what i'd like to play' or ' I wish there's a game that be like this or that' ; So being unique is great! otherwise i'd be playing someone else's game and not creating . Thank you so, I wasn't so sure on interface design at first, cause i got too familiar with commonly futuristic UI style. Very interesting and unique aesthetic. Looking forward seeing this game as it develops. The visuals look great! Looking forward to seeing how this game evolves.